I now am looking into a slightly more involved app, where as before I'll use 3rd party logins, but also maintaining data for a user. I will be wanting to have both a standard web site interface, and REST endpoints for mobile app interaction. I will also want to have a basic Android and iOS app that makes use of the app. While I could do this myself, I decided to look around to see what was available to handle even more of the grunt work. A quick search led me to StrongLoop's Loopback framework and it looks slick. there had been a commit just nine hours prior to me looking at the github project for the first time. It's based on Express - not a prerequisite, but that little project was part of my first exposure to the node.js app world, and I'd prefer to stick with it for now. 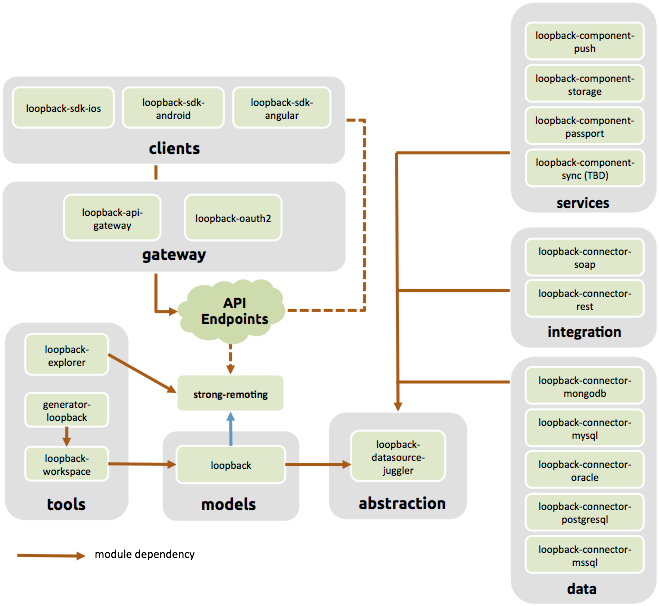 A summary of Loopback and its associated modules is below (from their github site). This has got me thinking of setting up a boilerplate app that has all the basic endpoints for user management, and has the groundwork for for iOS, Android, and web clients. Then, for a custom app you just start from there and add the extra stuff you need to quickly see if the app/idea has any traction. No matter what I end up doing shortly, this looks really cool.